Along an alleyway amid a shanty town in the old port district of Bombay where in the nineteenth century the great steamship company P&O built its vast dockyard stands a shrine to an African holy man. There, a short stretch from the water's edge where wrecks of cargo ships loom above the low dwellings of the shoreline, women are brought to be cured of possession by malevolent spirits. Although the holy man buried there was a Muslim, the shrine specializes in festive and musical cures as the women dance away the spirits' hold over their souls. In an Indo-Islamic equivalent of the blending of African traditions with Catholicism in the Vodoun of the Caribbean, there beside the Arabian Sea the drums and rhythms of Africa were imported to serve an urban population hungry for new cures and rituals. When I visited the shrine as part of my research for Bombay Islam, most of the pilgrims were lower class Indian Muslims, but according to police records, when the shrine was founded in the late 1800s it catered largely to the East African sailors who manned the coal barges and engine rooms of the steamships whose traffic made Bombay the richest Asian port of the age. With the paltry surplus of their wages, these African sailors who stood on the lowest rung of the industrializing hierarchy of the Indian Ocean patronized a shrine to one of their own, an African Muslim saint whom they believed had settled in India centuries before the British ever set foot there. Together with the tantalizing exorcisms and imported rhythms of the shrine's daily services, the small scale investments of the African sailors in their simple tin-roofed shrine attracted a growing number of dockworkers to attend the macabre spectacle of this 'Muslim Vodoun'. While never gaining followers from the respectable merchant class among the city's Muslims, the shrine nonetheless flourished among the deprived denizens of the dockyards. 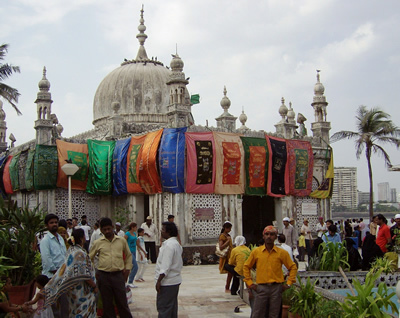 Amid a bustling religious marketplace of spiritualized products and supernatural services carried in from all corners of the Indian Ocean, the unique and darkly entertaining services of the dockyard shrine lent it a niche but effective appeal to a burgeoning consumer base of proletarian Muslims in Bombay's age of industrialization. The Afro-Indian shrine in the P&O dockyards is only one of many examples of what in Bombay's Victorian heyday became an oceanic religious marketplace that centred on the port city as the hub of the Indian Ocean's commercial and communication networks. In tracing these routes of religious export and import, my research took me not only to Bombay and such other Indian cities as Hyderabad, but also to the trading towns of Iran and Yemen and the port towns of South Africa and Malaysia that in the nineteenth century were brought into Bombay's industrialized economy of religion. Empowered by the promotional possibilities of cheap vernacular printing and distributed aboard the steamships that plied the ocean from her quaysides, the reputations of Bombay's religious entrepreneurs were built on both the physical and imaginative fabric of industrialization. Holy men not only sailed on steamships, they lifted them from the waves when typhoons surrounded them. The newly mechanized scale of the city's production of new Islams through religious 'firms' controlled by individual spiritual entrepreneurs or elaborate hierarchies of missionaries heralded a new era in religious history where every product bore the stamp of the industrial age: whether in terms of saintly graves built into the neo-Gothic railroad palace of Victoria Terminus or cheap journalistic hagiographies describing holy men destroying Bombay's first skyscraper for the sins of its barflies; whether in terms of preachers who sailed to Iran to spread word of the living imam who dwelt in Bombay or faqirs whose miracles rescued steamships carrying Indian immigrants to South Africa from the perils of cholera and shipwreck. Joseph Conrad's Lord Jim was by no means the period's only popular story of Indian Ocean terrors and rescues. Many other strange tales were told in such oceanic languages as Persian, Arabic and Urdu and printed on the abundant vernacular presses that made Bombay the most important publishing centre in the entire Indian Ocean. In studying these stories of an enchanted industrialization, my task in Bombay Islam has not been merely to collate individual specimens but to make sense of their collective meanings. For along with the shrine festivals and supernatural cures manufactured alongside them, these tales were the products of an economy of religious enchantment that held tremendous appeal to the tens of thousands of Muslim industrial and commercial labourers who worked not only in Bombay but also along its capillaries of commerce that reached the Middle East and Africa. Here in the epicentre of Asian modernity was a process quite opposite to Max Weber's celebrated theory of Entzauberung or 'removing the magic' from daily experience. 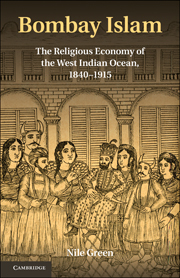 It is the nature and significance of this religious economy that Bombay Islam explores as a parallel to the predominantly Christian but no less internally pluralistic and productive religious economy of the industrializing Atlantic in the same period. And in unravelling the many varieties of Islam produced in Bombay's heyday as the oceanic vanguard of modernity, Bombay Islam also makes larger claims about the history of religion, the study of subalterns and labourers, and the tools with which we should analyze the plethora of new Islams produced in the modern era. If as a historian and social scientist I have aimed to bring conceptual clarity to the dark mysteries of possession and the soothing marvel of miracles, as a traveller and ethnographer I have also tried to capture the strange ways of the saints and the eerie enticements of the shrines that were ultimately the supernatural stock-in-trade of these oceanic enchanters. For in the sultry waters of the eastern hemisphere, many new things were made from the message of Muhammad. Nile Green is Professor of South Asian and Islamic History at UCLA. His new book Sufism: A Global History will be published by Wiley-Blackwell in 2012.